Previous studies have suggested that medicines—both prescription and over-the-counter—aiming to block the actions of acetylcholine may be associated with increased risk for cognitive impairment, but a new study published this week in JAMA Internal Medicine shows that use of such medicines in older adults may increase risk for dementia. Researchers from the Geriatric Pharmacy Program at the University of Washington led a study with over 3,400 participants, aged 65 years and older and no history of dementia at the study's initiation, to examine whether a correlation existed between cumulative anticholinergic drug use and the onset of dementia. Pharmacy-dispensing data were analyzed over a 10-year period to ascertain patients’ cumulative anticholinergic exposure. The researchers noted that the study highlights the need to increase awareness among health care professionals and older adults about the potential risk associated with extended use of anticholinergic drugs, as well as a need for efforts to minimize such drug use. 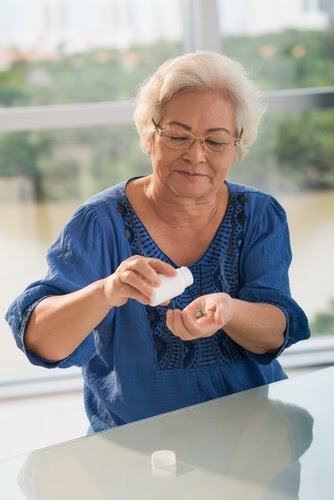 "Older adults should be aware that many medications—including some available without a prescription, such as over-the-counter sleep aids—have strong anticholinergic effects," said the study’s lead author, Shelly Gray, Pharm.D., M.S., director of the geriatric pharmacy program. "If providers need to prescribe a medication with anticholinergic effects because it is the best therapy for their patient," Gray stated, "they should use the lowest effective dose, monitor the therapy regularly to ensure [that] it's working, and stop the therapy if it's ineffective." To read about other medicine use that has been associated with an increased risk for the dementia, see Psychiatric News article "Long-Term Use of Benzodiazepines May Be Linked to Alzheimer’s."